I've always enjoyed browsing pet store aisles for the latest in cute cat toys, but lately I've found it even more fun to stay home and visit online retailers to see what creative entrepreneurs are developing for our pets. As I mentioned very recently, a goal of mine is to one day make and sell cat toys of my own, but until that day comes I'm absorbing all I can from people who are building a successful business out of creating things that will make cats happy. I was recently introduced to a company called munchiecat, makers of cat toys for felines who enjoy the finer things in life! They recently completed a successful Kickstarter campaign for a ridiculously adorable Wine & Cheese Deluxe Set of 9 toys: 2 wine bottles, 3 pieces of cheese, 2 olives and 2 figs! 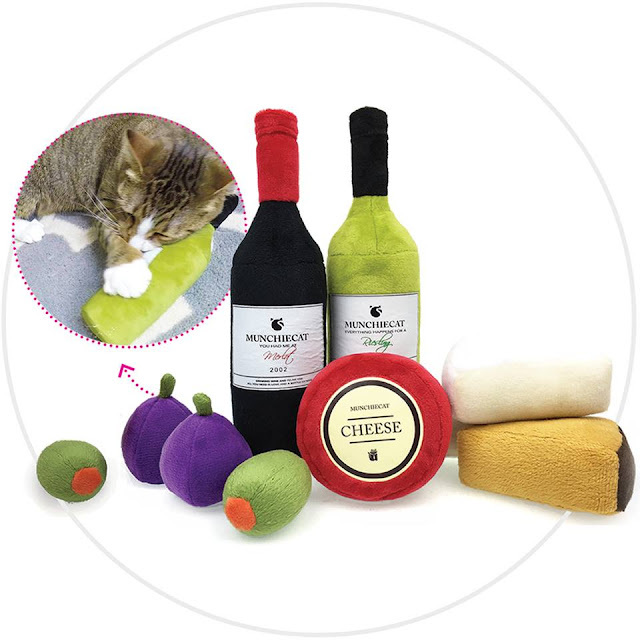 Munchiecat’s Wine & Cheese Set is a variety pack including catnip, crinkle, and toys with bells sewn in to offer a wide range of fun for your kitty in a variety of sizes and shapes from 2” Olives to 8” Wine Bottles. With so many toys to choose from there's something in the set for every cat's taste! Growing up in our house meant sharing life with pets and so my love affair with animals began early. My siblings and I were ardent animal lovers and luckily we had a wonderful variety of pets from dogs, parakeets and cockatiels, to hamsters and guinea pigs. I absolutely adored my pets and was the girl who’d dress up her guinea pigs and spend her free time beautifying pet homes with fancy toys and accessories. Fast-forward to today—married with three kids, and living the apartment-in-the-suburbs-life, unfortunately we can't have large furry pets for now. But I still have many little animals living with us and get to pass onto our kids the joy of life shared with pets!! My dream for munchiecat started about 3 years ago, while buried in accounting work and unhappy with the daily grind. I had a stressful job and really needed a creative outlet. I enjoy making crafty things and spent some time browsing online simply looking for inspiration. I wanted to find modern and beautiful cat toys to make as a gift but had a hard time finding anything that I liked. And that’s when it hit me; the world seriously needs more beautiful cat toys. 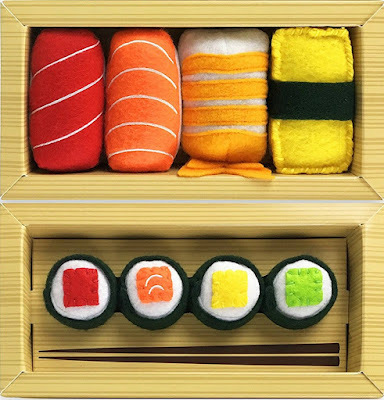 I was inspired to make a Sushi themed cat toy set because I love sushi and thought it would be an adorable toy for my cat-loving friend. She loved it, her cats loved it, other humans loved it, and their kitties loved it, and I thought to myself...why not try a Kickstarter? I never in a million years thought there would be so much interest or that our campaign would be so successful! But here we are! A year later, and now launching a Wine & Cheese themed set as a result of numerous feedback requests from previous customers and supporters. I’m humbled by the enthusiasm and support for my work. I hope to continue designing pet toys that emphasize safety and aesthetics for a long time. Yes, you read that right: Sushi cat toys, and they are every bit as adorable as you think they are. 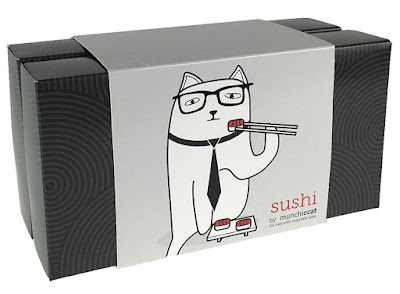 Available in a four piece set of Maki sushi, a four piece set of Nigiri sushi, or the deluxe 8 piece set of both collections, they come packaged in a bamboo-print gift box, purrfect for gift giving. These sushi toys are made with wool felt and filled with polyester fiber and catnip (Nigiri) or with bell inserts (Maki) in small batches to ensure freshness and quality. Munchiecat also produces fun t-shirts for the cat-loving humans in your life, featuring cats noshing on - what else - sushi and wine! Munchiecat has created some of the most sophisticated and stylish cat toys you will ever encounter. Already incredibly popular, when you visit their website you'll see that everything is listed as sold out! We have an exclusive scoop for you though: a Pre-Order Store is going live as we speak for the Wine & Cheese toys as well as the newest version of the sushi toys! We're super excited to see these toys in purrson, and just as excited to see what munchiecat has planned next! Purrsonally, I wouldn't mind seeing a box filled with assorted chocolate truffles...for cats, of course! When it comes to enjoying the finer things in life, is there anything better than chocolate? Stay up to date on all the exciting news coming from munchiecat by following them on Facebook and Instagram. This post is sponsored by munchiecat. I am being compensated for featuring this content but we only share information we feel is relevant to our readers. Munchiecat is not responsible for the content of this article. This post also contains Amazon affiliate links. OMC, those toys are adorable, and so, so stylish. These are too cute and purrfect! They really do look so real, and there's no doubt kitties must enjoy these so much. Thank you for always sharing such fun finds with us, Mudpie and Melissa! These are super cute toys! What fab toys! We love them. They do look like fun and would make great gifts.